Blackmon Drive (Medlock neighborhood, Scott Blvd. intersection) is not yet closed to inbound traffic... but we are almost there. 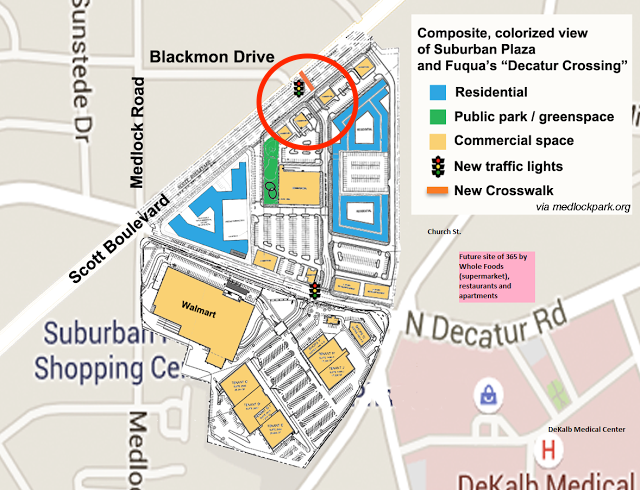 of new/redeveloped/soon-to-be-redeveloped commercial spaces near the Medlock neighborhood. 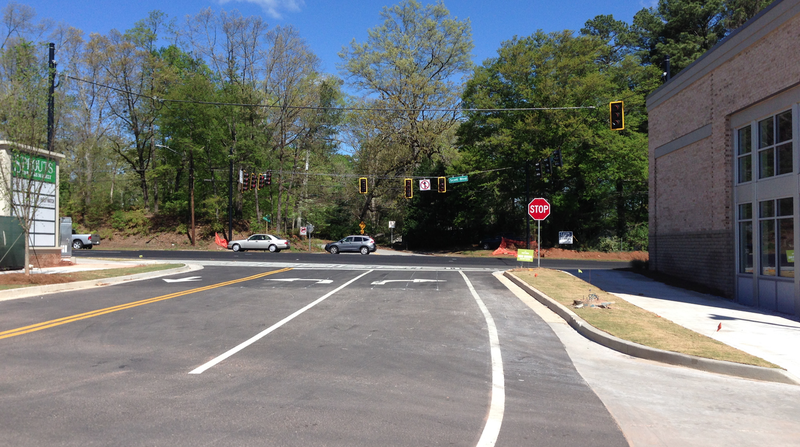 Traffic and crossing lights are now installed, if not yet operational. 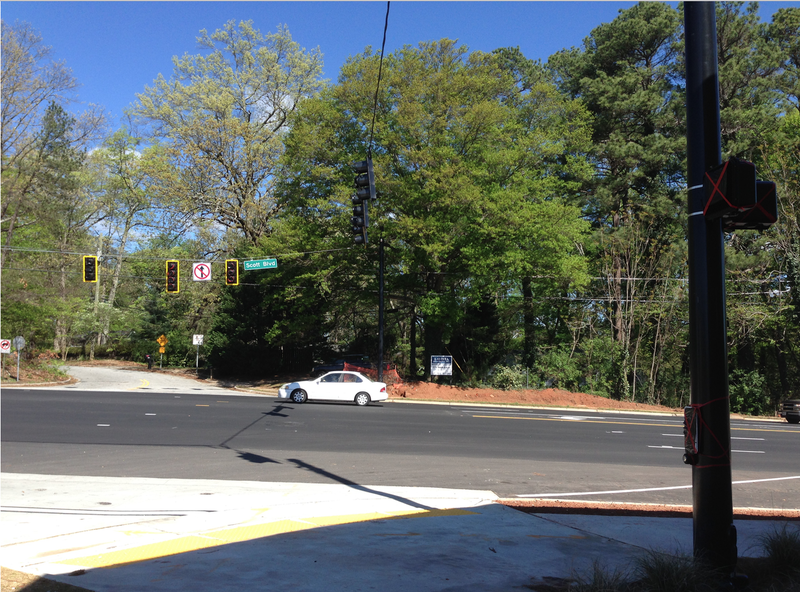 Soon, pedestrians and cyclists will have a safer access point to/from "Decatur Crossing"--Fuqua's development at the former site of the Scott Blvd. Baptist Church and nearby lots. As seen from your bike as you approach the Blackmon/Scott Blvd. intersection. Click to enlarge. Soon--you!, with your parcels, your full belly, getting ready to hit the crossing light and head on home. Sprouts has been open for about a month now and seems to be drawing good crowds. Behind Sprouts, on the Scott Blvd. side, a Zoe's Kitchen and The Joint Chiropractic are well on their way. Across from Sprouts, North Decatur Rd. 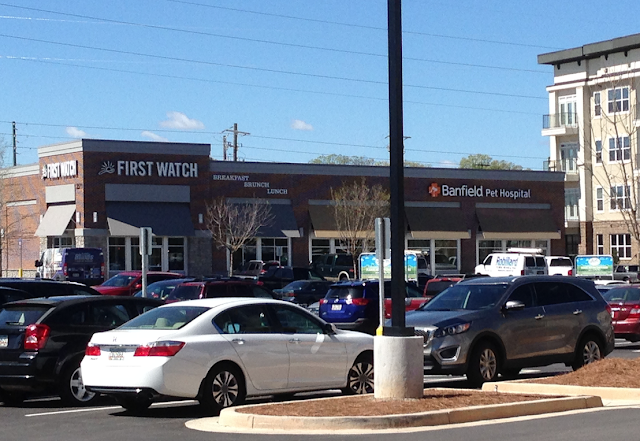 side, there will be a First Watch (a breakfast/lunch restaurant, see article about it here, opens April 10) and a Banfield Pet Hospital. Visible to the right is part of a Point on Scott apartment building.